Tyrrell's English Chips just launched in the U.S. this past fall and I am so excited to introduce (or re-introduce if you're lucky enough to have already tasted the yumminess!) you to my new favorite snacks! Tyrrell's English Chips are hand cooked in small batches on the company's farm in the beautious English countryside, and are made from only two super special potatoes (the Lady Claire and Lady Rosetta) that are sourced from 10 local farms (so the quality of the chip is consistent through the year!) Every flavor is gluten-free, hand-cooked in small batches with all natural ingredients, and most are vegetarian and vegan friendly too! HAPPY SNACKING FOR EVERYONE! I was lucky enough to be able to try a bag of each Tyrrell's chip varieties and they were each so flavorful and perfect! Lightly Sea Salted-I'm a purist, so the most basic, classic, variety was obviously my favorite. Perfectly crisp and with just the right amount of salt, these chips were just about perfect in every way! I finished the bag in about 15 minutes flat! Sea Salt & Cider Vinegar-Could these be more British? The chips are great-still a classic and the vinegar is just right, not too overwhelming. Delish. Mature Cheddar & Chives-Mmmm cheese. Mmmm chives. All on one tasty potato chip! Worcestershire Sauce & Sundried Tomato-Subtly sweet and tangy and entirely unique. Sweet Chili and Red Pepper-I did not personally taste this (as my tolerance for spice is just about 0) but when I put these out at a party all I could hear was how much everyone loved these delightfully spiced chips! Beetroot, Parsnip, & Carrot Chips with a Hint of Sea Salt-Veggie chips! These were a giant hit with Michael's aunts, the vegetable flavors were so true and so fresh. Lovely. The winner is Kim from Treats & Trinkets! CONGRATS KIM! 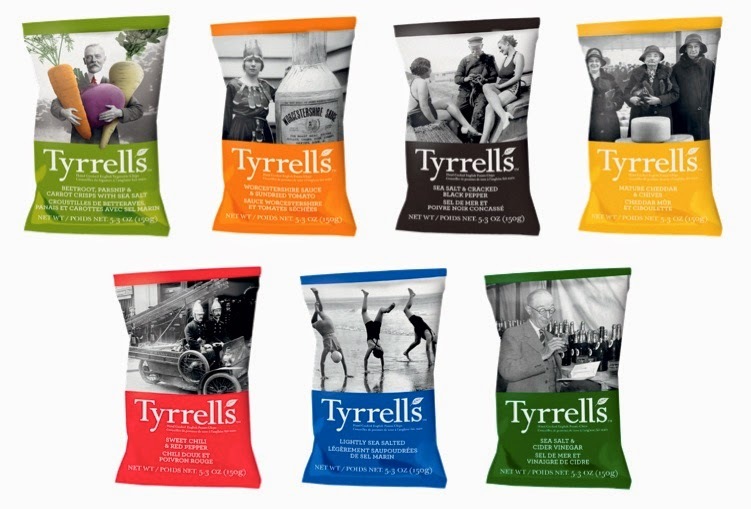 One reader will win each flavor of Tyrrells English Chips (that is available in the U.S.) in a Tyrrell's tote bag! Giveaway closes July 31st, 2013, 11:59PM EST. After the contest is over, I will send the winner an email (so please make sure you provide an email address or some other way to get in touch with you), and get you your prize. The winner will have 3 days to respond or another winner will be chosen, all prizes will be awarded. The winner will be chosen via a random number generator. Open to U.S. residents over the age of 18. NO PURCHASE NECESSARY. Tell me which flavor of Tyrrells English Chips you are most excited to try? "Like" Tyrrells Chips USA on Facebook-leave a comment on here letting me know. Follow @TyrrellsUSA on Twitter-leave a comment tell me you did. Disclaimer: Tyrrells English Chips provided me with product, and I was under no obligation to review if I so chose. Nor was I under any obligation to write a positive review or sponsor a product giveaway in return for the free product. My opinions, as always, are all my own. We are not liable for technical failures or typographical errors, or resolving identity disputes related to the winner.VOID WHERE PROHIBITED BY LAW.